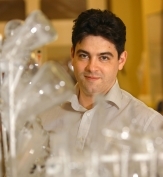 Prof. Lee Cronin is the Gardiner Professor of Chemistry in the School of Chemistry at the University of Glasgow. Cronin has published over 250 papers that have amassed over 6000 citations in the worlds leading scientific journals and has given over 180 invited talks. He has over 40 national and international collaborators. LC has active industrial collaborations with BP, Samsung, FujiFilm, QinetiQ, Oxford Diffraction, Unilever. Much of this work is converging on exploring the assembly and engineering of emergent chemical systems. Cronin group is unique bringing together chemists, chemical engineers, reaction modelling, complex system modelling, evolutionary theory, synthetic biology, robotics and AI. Cronin is also developing several new reaction-formats for chemical including flow reactors for evolvable chemistry, 3D-printing wetfab for the democratization of chemistry e.g. synthesis of drugs important for the developing world (e.g. anti-malaria) as well as counterfeit drug sensors.